If, as the saying goes, “a picture is worth a thousand words,” what’s the marketing “worth” of four pictures? Twitter has introduced another new tool that can multiply the impact of your communications. The social media giant unveiled its photo collage feature that delivers even more message-mileage. Now you can share up to four photos within a single tweet. Although the long-standing 140-character constraint is still the text limit, tweets with one (now up to four) photos jump from the Twitter stream like an Atlantic Salmon leaping upstream. The science folks tells us that pictures are about a zillion times more attention-getting than plain text. Don’t quote us on the math, but Twitter knows that visual images draw more attention, connect to the brain faster, and are more memorable than words alone. With the four-photo collage capability, Twitter takes a page from other social media platforms. Photos on Facebook generate over 50 percent more Likes than the average post, according to a HubSpot study, for example. Twitter’s text limitation hasn’t been a handicap. If anything, it has inspired considerable creativity in marketing meaningful (albeit brief) messages. Not long ago, Twitter users broke the 140-character barrier with images, graphs, charts, and the like becoming increasingly common with of the Tweet. And we expect that Internet advertising in the health care arena will find new and creative ways to “collage” on the social front. 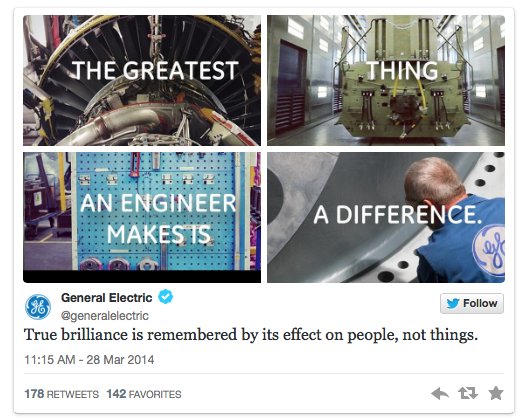 The business publication AdvertisingAge put an industry spotlight on early-adopter brand names, including this example by General Electric (with 9 more words).